Mission: Prevent homelessness by providing, homes, rent, utility assistance, love, and care for homeless families and children (birth-age 8). Homes for homeless families and children in collaboration with Denton Affordable Housing. New Beginnings pays the rent and utilities to enable homeless families to live independently in their own homes. All families are case managed in collaboration with Arms of Hope, a faith based 501 (c) (3), social service agency. Emergency rent and utility assistance. New Beginnings collaborates with the Social Work Department of the Denton Independent School District to keep families “off the street” and stay in their own homes. New Beginnings provides families who are at risk of becoming homeless with short-term rent and utility assistance while social workers help stabilize their living circumstances. New Beginnings is thankful for our collaboration with the Denton Public Schools Foundation. New Beginnings provides emergency rent and utilities payments to prevent homelessness for Denton Independent School District (DISD) families and children. 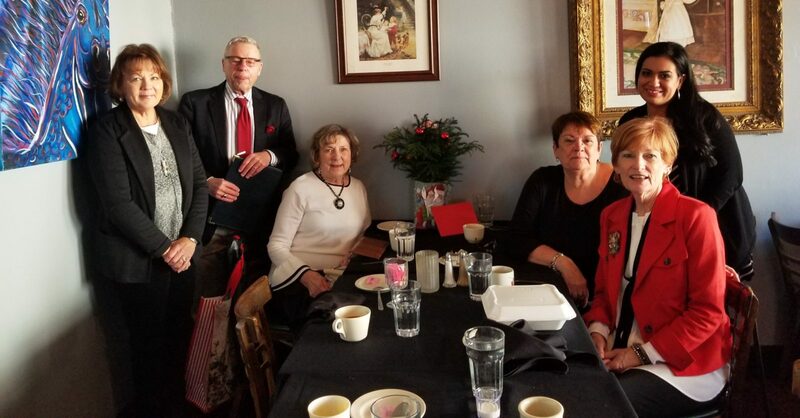 Pictured L-R: Connie Thorton (Denton Public Schools Foundation), (George and Betty Jane Morrison (New Beginnings), Barb Haflich (Coordinator of Social Services, and Homeless Liaison for Denton ISD), Jacqueline Jackson ( Executive Director, Denton Public Schools Foundation), and Adriane Cruz (Denton ISD Social Services). Household furnishings. Many of the families New Beginnings supports come with nothing but the clothes on their backs. New Beginnings provides beds, sofas, tables, chairs, dressers, and kitchenware. 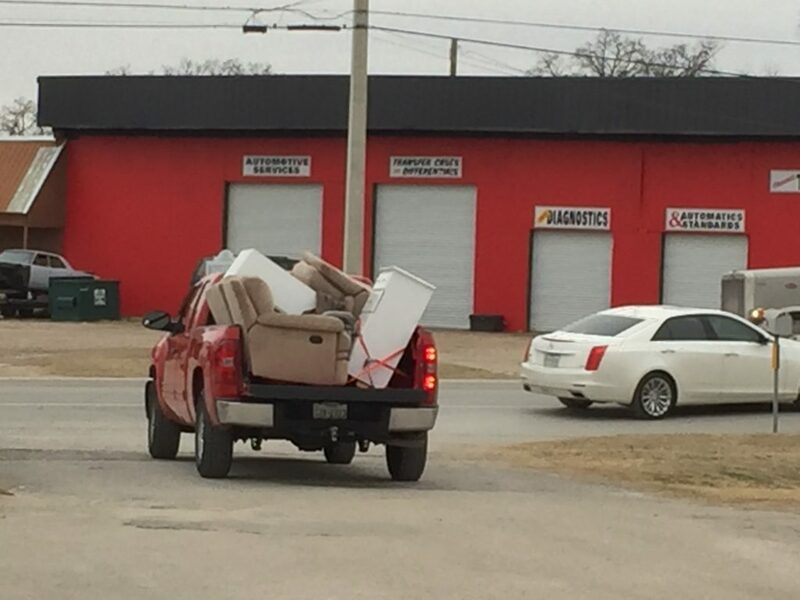 A load of furniture on its way to a New Beginnings family. 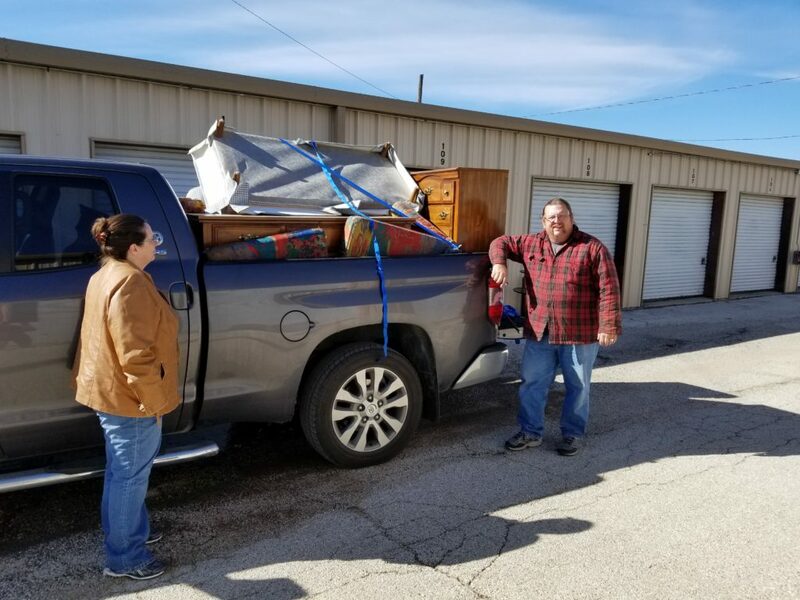 Furniture donations make a big difference in the lives of New Beginning’s families. 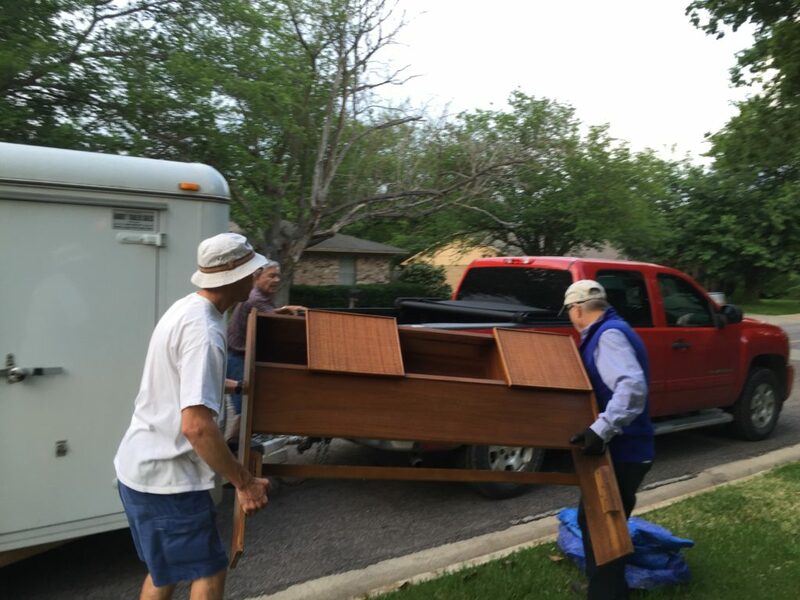 Volunteers load furniture for another New Beginning’s family. Providing furnishings for New Beginnings families creates a loving and caring environment and helps make a house a home. Make a tax deductible donation to help New Beginnings prevent homelessness. Providing shelter, rent and utility assistance for homeless families and children requires financial resources. Monthly rentals for our families who are in their own homes costs between $650 and $950 a month, depending on the size of the family and the home New Beginnings rents. Each family needs support anywhere from 6-18 months. Emergency rents and utility payments to keep families and children from being evicted or their utilities shut off range from $500 to $1,300 for rent and $400 to $1,000 for utilities.People provide financial help in a variety of ways. Some contribute a regular amount each month as part of their tithe. Some contribute to New Beginnings on behalf of loved ones in honor of birthdays, anniversaries, etc. One Sunday School class contributes their weekly offerings to the work of New Beginnings. Other individuals donate lump sums as they are called to contribute. Donate household items in good to excellent condition. 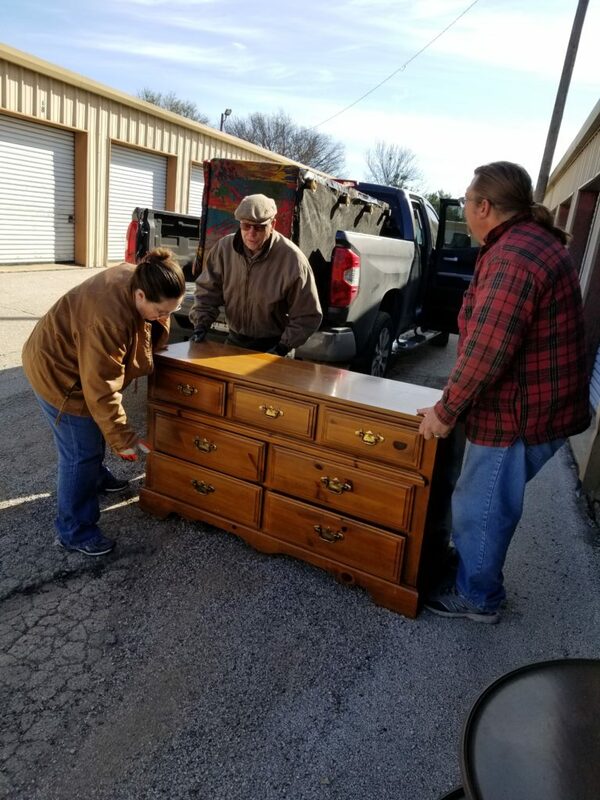 New Beginnings does not accept broken furniture, spotted mattress, and electronics of any kind. Goal: Prevent Homelessness with rent and utility assistance. 7 Families: 8 Adults, 16 Children. Goal: Provide homeless families with their own homes. 9 Families: 9 Mothers, 20 Children. Total families and children helped in 2018: 16 families, 36 children. Graduation: In 2018, three New Beginnings’ mothers and their families became self-sufficient. Goal: Prevent Homelessness with rent and utility assistance. Goal: Provide homeless families with their own homes. Goal: Provide rent and utility expenses for single parent mother with cancer and her child. Early one morning, a woman was walking along the sea shore after a big storm. The beach was littered with starfish as far as her eyes could see. At New Beginnings: The Betty Jane Morrison Foundation for Homeless Children, we understand that we can’t help all of the homeless children and families in North Texas. But we can, and we do, help one family at a time. Currently, New Beginnings, in collaboration with Denton Affordable Housing and Arms of Hope, both 501 (c) (3) agencies, supports five (5) families with 13 children with rent and utility money and provides them with their own homes. In addition, to date, New Beginnings, in collaboration with the Social Work Department of Denton Independent School District, has provided 27 families and 47 children short term rent and utility assistance to prevent them from becoming homeless. By helping one family at a time, we are making a difference. New Beginnings is a 501(c) (3) non-profit organization and all contributions are tax deductible. In addition, New Beginnings has no administrative costs. ALL contributions go directly to prevent homelessness and to provide shelter, love, and care for homeless children and families.